Israel is, among other things, a land of heritage, antiquities, long and complex history, and a land of religions. This country has a special significance for major Abrahamic religions, but also to those who consider themselves their successors, such as the Baha’i faith. While it’s very difficult to choose just a few holy sites as the most important, there are some that are always included in the best tours to Israel from the USA , and deservingly so. 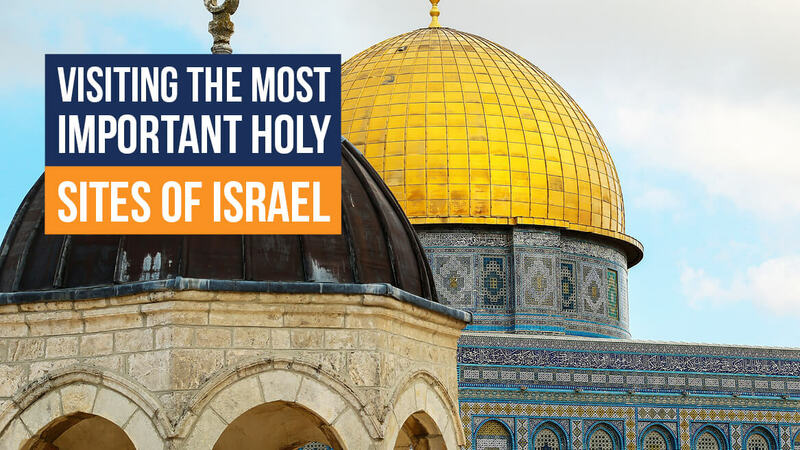 Unsurprisingly, there are many holy sites in Jerusalem, so let’s take a look at some of those first before visiting a few fascinating sites in other places as well. One of the most famous places in Israel, the Western Wall, or the Wailing Wall, is a limestone wall in the Old City of Jerusalem. Interestingly, what we see today is just a segment of a far longer retaining wall. It was built by Herod I during the expansion of the Second Jewish Temple in 19 BCE, on the hill of a great importance to Jews and Christians, the Temple Mount. Muslims believe this to be the site where the Prophet Muhammad tied his horse al-Buraq before ascending to heaven. The Second Jewish Temple was destroyed in 70 CE and a Roman temple was built in its place. On the site of that Roman temple now stands the Dome of the Rock. This World Heritage Site is an Islamic shrine originally constructed in 691 CE. Its architecture and mosaics were inspired by nearby Byzantine palaces and churches. Muslims believe that the rock in its centre is connected to the creation of the world, that Mohammed started the Night Journey here, and that Abraham was called to sacrifice Ishmael either here or in Mecca. Jews believe the rock to be the Foundation Stone from which the world expanded, a place where Adam was created, and where Abraham attempted to sacrifice Isaac. Situated on the south side of the Temple Mount, originally built in 720 CE, Al-Aqsa is the third most important site for Muslims, after Mecca and Medina. Muslims believe that Muhammad was transported from Mecca to Al-Aqsa during the Night Journey. The mosque is an example of early Islamic architecture and is located near the sites significant in Judaism and Christianity, particularly the site of the Second Temple, so visiting this area is truly a unique experience. An immensely important site in Jerusalem’s Christian Quarter, this church was constructed in 335 and reconstructed in 1048. Christians believe that this is the site of Jesus’s crucifixion, that Jesus’s empty tomb, where he is said to have been buried and resurrected, is located here, and that the last five stations of Via Dolorosa are inside the church proper. Hence, it has been a major pilgrimage site since it was first constructed. For truly awe-inspiring experience and sights, you must visit the Mount of Olives. This mountain ridge is named for the olive groves that once covered it. Jewish people have been buried here for centuries, so the Mount is one of the central places in the Jewish tradition. Also, several crucial events in Jesus’s life are said to have happened here: he wept over Jerusalem, prayed before his arrest, and ascended to heaven from this site. At-Tur neighbourhood, with a majority-Muslim population, is situated on the Mount’s top. Situated along the northern coast of Israel in Akko, this World Heritage Site houses the tomb of the founder of the Baha’i faith, Baha’u’llah, who died in 1892. The gardens, gorgeously decorated with plants, sculptures and fountains, are designed in a circular pattern surrounding the centre: the house where Baha’u’llah spent his final years and the shrine where his remains were placed. This is one of the two holiest sites associated with the founder of the Baha’i religion. The other is the Baha’i Gardens in Haifa. Numerous travellers visit the Baha’i Gardens on Mount Carmel in Haifa to enjoy its beautiful terraces, a UNESCO World Heritage Site. The shrine was built in honour of Bab Mirza Ali Muhammad, who was executed by Persian authorities in 1850 and is considered a martyr. The Gardens are almost a kilometre long and are comprised of nine concentric circles and nineteen terraces filled with flowers, trees, sculptures, water fountains and pools. There are wooded areas around the gardens, designed to be a home for wildlife and to reduce noise from the urban areas. Finally, the travellers can’t miss crossing the border to Palestine to visit this famous World Heritage Site, located in Bethlehem in the West Bank. This basilica is hugely important to Christians of various denominations as the birthplace of Jesus. Completed in 565, this Romanesque complex is one of the oldest constantly used churches in the world and the oldest major church in the Holy Land. It also houses the Church of St. Catherine and the Grotto of the Nativity.